Breakkie. Left overs charsiu made into jaffles. One good thing about cooking is that you get to eat left overs. 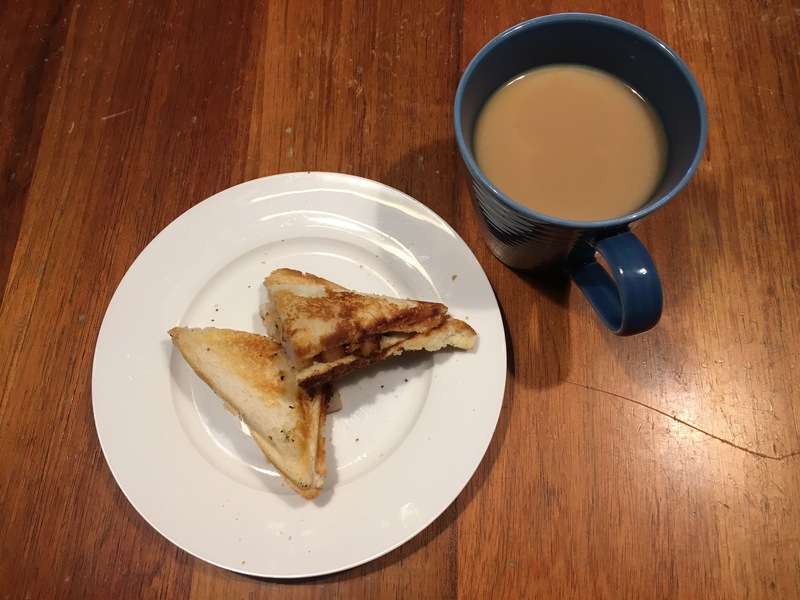 I’m going to finish my jaffle and work a bit on my blog. Then I need to go make cards. Another one gone yesterday . I think I’ve only got a handful left from the look of the stand . My head feels like it wants to blow. Will take something for it. Aim for today is to walk down the street to a blinds place. Since my surgery is not going to cost too much I’ve got money left over for new blinds for our bedroom. It’s been driving me mad having drapes as when the heater or AC is on it blows into the drapes. I’m thinking of getting Romans . That way I can just pull them up and out of the way when I don’t need them. The other reason is our room is quite small thus this way they won’t bundle up and make it look even smaller. Then I’ve got the usual dispensing to do since I didn’t get any done yesterday. I’m thankful I don’t live in a coffin cubicle.